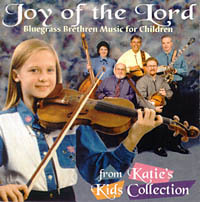 Children seem to really like Bluegrass Brethren music, and so we released a "Music for Children" CD. Back when we had a youngster in the band, we took the opportunity to feature Katie singing Bluegrass Brethren tunes, and folks seemed to really like it. It has the ever popular concert favorite song entitled "Rise Up". This also contains a couple of fiddle tunes played by 9 year old Katie and the band. Katie does most of the lead singing on this project which gives it that "Kid" feeling. This a good one for your kids or grandkids. Songs from the album were featured on the children's radio show, "The Puppet Factory".